On the afternoon of October 5, 2016, Los Angeles County Sheriff’s Department Sergeant Steve Owen and his partner responded to a burglary-in-progress call at an apartment building in the 3200 block of West Avenue J7. During containment of the area gunfire was heard in the rear of the location, authorities said. The deputy at the front of the complex ran in the direction of the gunfire and found Sergeant Owen suffering from a gunshot wound. The gunman fled and attempted to steal Sergeant Owen’s patrol vehicle. Another sheriff’s deputy arrived and opened fire when the gunman threw the car into reverse and rammed his patrol vehicle, injuring the deputy. The suspect then fled on foot and broke into a home where two teens were home alone. The teens were able to contact law enforcement and report the man inside their house. The LASD Special Enforcement Bureau responded, sending a special weapons team into the home. The suspected shooter exited the back of the home while the team got the teens out of the house to safety. The suspect was then taken into custody by Lancaster Station deputies. Sergeant Owen was transported to Antelope Valley Hospital. His wife, a LASD arson/explosives detective, was able to get to the hospital to be with her husband. Tragically, Sergeant Owen died hours later. In addition to his wife, Sergeant Owen is survived by two adult sons, a stepdaughter, and his mother. 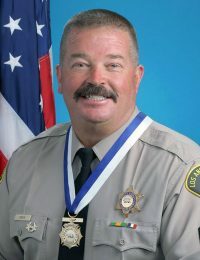 Sergeant Owen, age 53, was a 29 year veteran of the Los Angeles County Sheriff’s Department, serving the past five years out of Lancaster Station. In 2014, Owen was part of a team of sheriff’s deputies awarded the medal of valor, the department’s highest honor, for showing “tremendous bravery and determination” in saving a hostage who was held at gunpoint in a car. Additional details and funeral information will be posted as available.